These are raw but vital readings and recorded in Glazunov's St Petersburg - then Leningrad - right up close to the listener. There's no escape and you would not want to unless you must have much greater audio sophistication. If so then you need Serebrier's cycle on Warner. As it is the sound fills your loudspeakers and reaches out. This can be illustrated in the burred warmth of the third movement of the Fifth Symphony. Balletic sparks and sparkle crowd the room in the second movement. The outer movements are played with a wild-eyed enthusiasm and brilliance. 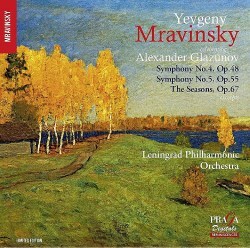 While the Fifth is probably Glazunov's most popular, the Fourth Symphony is very much stronger with gripping ideas, a stirring narrative and sanguine bubbling finale. It is in hyper-nationalist romantic language not a heartbeat's distance from the symphonies of Arensky and Kalinnikov. Ardent admirers of the Russian romantic symphony must hear this alongside the Melodiya versions by Nathan Rakhlin (sadly deleted vinyl only - HMV Melodiya ASD 3238) and Serebrier (Warner). The authentic burble of Soviet French horns in the first movement of the Fourth is just one marker of a grand tradition now much diluted. Those horns sing out in nocturnal warmth at the start of the finale of the Fourth. There's evident affection in these Leningrad readings — not necessarily a quality you may associate with Mravinsky. He is punctilious with dynamic markings as you will hear in the micron-calibrated Scherzo of the Fourth; scherzos usually play to Glazunov's strengths anyway. For bristling and pulse-accelerating joy do catch the pizzicato strings in the finale of the Fourth. We have seen these two symphony recordings before but not together. The Mravinsky Glazunov Fifth had pride of place on the conductor's volume in the Great Conductors of the Century series from IMP. As for his Fourth, a much earlier recording, it came out in the late 1990s from BMG-Melodiya and it was in sound less impressive than that miraculously and resonantly secured here by Praga. The extracts from The Seasons is new - or it is to me. It has the pristine shiver and imaginative majesty of Boris Khaikin's 1960s complete recording with the USSRSO. Once again the mics are in tight, even intimidating, proximity to the orchestra. Couple this with an 'impossibly' fast Autumn in which Mravinsky seems to be channelling the spirit of that other wild-eyed Russian, Nikolai Golovanov, and you could never claim that this is boring. Did the corps-de-ballet really dance to this Bacchanale (tr.13)? The latter is, by the way, the only movement to suffer from distortion on the bass-drum crumps - it can be lived with. It remains a pity that we have only extracts from the ballet. There's applause at the end of The Seasons but nowhere else. The CD is packed very fully. The liner-note in English and French is helpful and even specific on dates. Prime Glazunov in elite readings from the 1940s and 1960s in all their muscular dazzle.